Thirteen must-visit destinations for Chardonnay and Cabernet Sauvignon lovers. Western Australia’s Margaret River is home to some of the world’s finest Chardonnays and Cabernet Sauvignons. It isn’t exactly easily accessible—the region is three hours south of Perth, itself a five-hour flight from Sydney—but towering karri tree forests, stunning coastlines, and extraordinary wines make the trek well worth it. How virtuous do you feel? Grab a locally roasted coffee at Sidekick, a sunny café on the town of Margaret River’s main street, and, depending on your approach to life, fortify yourself either with a gluten-free, vegetarian savory muffin (shamefully tasty despite its healthfulness) or an equally delectable bacon-and-egg wrap with housemade tomato relish. 5/110 Bussell Hwy., Margaret River. Drive 45 minutes north to the Cape Naturaliste Lighthouse, built in 1903 from local limestone, and climb up to the observation platform. You’ll find spectacular views of the Margaret River wine region, the Geographe Bay coastline, the Indian Ocean, and, potentially, migrating whales (the season is from September to December). 1267 Cape Naturaliste Rd., Leeuwin-Naturaliste National Park. It’s a 25-minute drive to Deep Woods Estate, where winemaker Julian Langworthy makes some of Australia’s most acclaimed reds (they’re not currently imported to the U.S., so this is your chance to try them). Taste the layered, black currant-y 2015 Reserve Cabernet Sauvignon—the 2014 vintage won the Jimmy Watson Memorial Trophy, Australia’s most prestigious wine award, and the ’15 is no less impressive. 889 Commonage Rd., Yallingup. As you head south along Caves Road past forest and vineyards (and, more than likely, kangaroos), you’ll hit Cullen Wines. Founded in 1971, it’s now run by the brilliant winemaker-owner and overall force of nature Vanya Cullen. Take a self-guided tour through the property’s biodynamic garden to understand her eco-friendly approach to farming, and then have lunch in the restaurant. Chef Iain Robertson focuses on local ingredients for dishes such as Manjimup marron (a species of large freshwater crayfish) with kimchi cucumbers—ideal with the winery’s 2016 Kevin John Chardonnay. 4323 Caves Rd., Wilyabrup. Two minutes away, stop in at Margaret River’s oldest winery, Vasse Felix. Book a tour to visit both the estate’s original vineyards and the cellar, ending with a staff-led private tasting. If the Heytesbury Chardonnay isn’t open to taste, buy a bottle—it’s one of Australia’s greatest white wines. Caves Rd. at Tom Cullity Dr., Margaret River. Check into the Losari Retreat for the night. This boutique resort is tucked amid the trees 10 minutes from the town of Margaret River on the edge of the Wooditjup Natural Park. Take your pick of the six private villas, soak in the outdoor whirlpool spas overlooking the property’s lake and gardens, and explore the 66 acres of forest groves, granite bridges, and fountains. Doubles from $225 per night; 498 Osmington Rd., Margaret River. Pop back into the town of Margaret River to hit Settlers Tavern. This local favorite seems for all the world like a classic, casual Aussie tavern—live local bands, sports on the TV, pool tables—but when it comes to wine and food, the comparison ends. Local line-caught fish, Southern Ocean oysters, excellent steaks (using Western Australian beef), and a vast wine list featuring older vintages from the best local producers (try a bottle of the nuanced 2008 Moss Wood Cabernet, for instance) make it a must-visit. 114 Bussell Hwy., Margaret River. 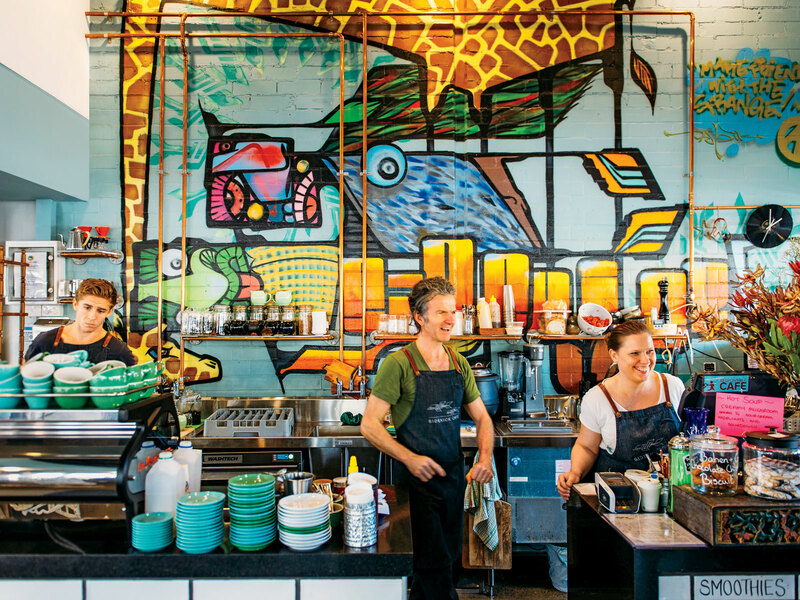 Perched above the white sands of Gnarabup Beach, right outside Margaret River, is the White Elephant Beach Café. Grab a table overlooking the turquoise water, order a bacon-and-avocado (or avo, if you’re a casual, beach-dwelling Aussie) on rye with feta and pepitas, and follow it up with a morning stroll down the beach. In 1972, Denis and Tricia Horgan transformed an old cattle ranch into Leeuwin Estate, one of Margaret River’s most celebrated wine producers. Book in advance for the Ultimate Degustation Experience ($200): a behind-the-scenes tour, tasting of Leeuwin’s top wines, and seven-course lunch in the winery’s superb restaurant. Dishes like local abalone with black bean, tomato, and enoki mushrooms are matched with older vintages from the cellar. After lunch, drive south on Caves Road, and turn right on unpaved Boranup Drive, which winds through a gorgeous forest of slender, towering karri trees, a native species found only in Western Australia. At the lookout spot, get out and gaze over the forest canopy to the waters of Hamelin Bay. On the way back, stop at Boranup Gallery, which sells lovely burl wood bowls and other housewares from local artisans. 7981 Caves Rd., Margaret River. Stop in at McHenry Hohnen, home to some of the region’s best Chardonnays (try the complex Burnside Vineyard, from the winery’s oldest vines). The smoky aroma here isn’t from toasted barrels, though: First-rate sausages and cured hams from cofounder David Hohnen’s The Farm House project are also available. Stock up! 5962 Caves Rd., Margaret River. Xanadu’s name may summon alarming memories of the bad ’80s movie starring Aussie pop star Olivia Newton-John, but the wines at this pioneering Margaret River winery are uniformly excellent. Make sure to try the 2014 Reserve Cabernet, a standout at the region’s 50th anniversary tasting last year. Boodjidup Rd., Margaret River. For dinner head to Swings Taphouse & Kitchen, a low-key local-winemaker haunt. The wines on tap are excellent, as are the local beers. Share some rock oysters and a pizza—go for the Bufalina, with buffalo mozzarella, wood-fired tomatoes, and wild olives. Relax. And maybe decide to stay another day. 85 Bussell Hwy., Margaret River.